Volleyball headband apparel is a great way to show your love for volleyball and support a great cause as you play while keeping hair and sweat out of your face. 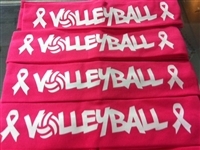 One of the most popular headbands are breast cancer awareness volleyball headbands which raise awareness for breast cancer. We have other headbands including volleyball embroidered headbands and rhinestone volleyball headbands all at great prices.